If you’ve got ten days spare for an India rail tour then southern India, Karnataka, in particular, should certainly be one of your first ports of call. 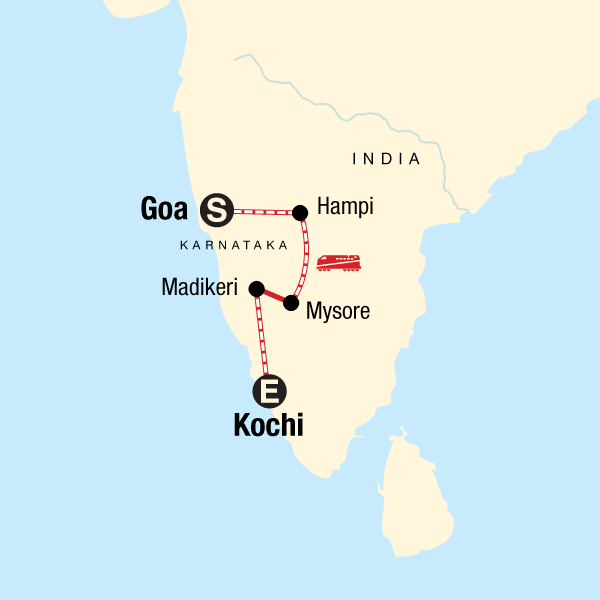 Starting in Goa this ten day India rail tour takes you from the sun-kissed beaches and hippy hangouts inland to the stunning UNESCO listed temple ruins of Hampi before heading south, through Karnataka, to the palaces of Mysore. Coffee plantations, hill stations and Raja fortifications await in Madikeri as your India rail tour continues through Karnataka before finally bringing you to the spice markets and trading barges of Kochi, the gateway to southern India’s world-famous backwater canals. India is the world’s second most populated country so it goes without saying that protecting the environment and minimizing impact needs to be at the top of list of things to do, period. Our company adheres to strict beliefs in making the world a better place and minimizing our footprint wherever we go. Tour leaders provide travellers with information about local environmental issues in their respective regions, and provide suggestions of how we can best protect the local environment and culture. Low Impact Transportation: Taking the train is not only a great way to get a lot from your trip in a short amount of time but it’s also better for the environment than many other alternatives. Travelling in India is all about community and feeling like you’re a part of it is an integral part of travelling. Protect the community around you by respecting it, the people, the environment and the culture. Visiting World Heritage Sites is a great way to support the community too. On this trip take the UNESCO designated Nilgiri Mountain Railway, pass through the Western Ghats and visit the Churches and Convents of Goa.